I’d like to congratulate Apple Customer Service for the way they handled the most recent issue with our iMac G5. If you’re a regular reader, you may know we’ve had problems with our iMac right from the start. Virtually as soon as we brought it home from the Apple Store, we had issues with it. These things got worse with time, and although we took the iMac in for repairs, repeatedly, the problems persisted. I detailed that first set of issues in this post. Several months later, we took it in for service at our local Apple Store, where we had a terrible experience. 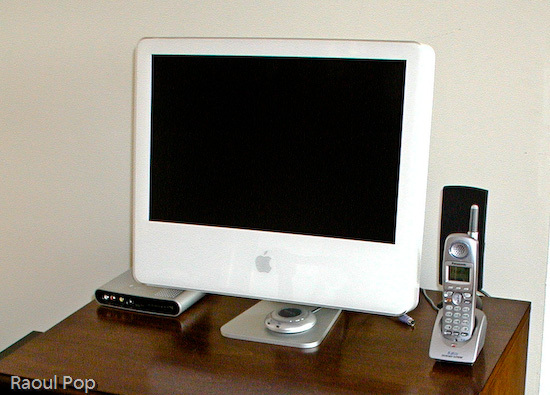 A few months after that, we took it in for service again, and then, a month or so before Apple Care ran out in late 2008, we took it in for what we hoped would be its last service call. Unfortunately, it stopped booting up a month after Apple Care ran out. We were packing for what would turn out to be a long trip abroad, and didn’t have time to take it in for service during the 90-day warranty window offered for that last repair. I kept it boxed up, hoping I’d get to it at some point and who knows, perhaps it would auto-magically boot up. I was soured up with the whole affair, and said as much in this post. In three years of using the iMac, we’d had problem after problem, and I felt as if we never got our money’s worth from that machine. I liked it, Ligia liked it, but it just couldn’t be relied upon, and it was a shame. By the time I got to have a look at it, it was late 2009, about a year later… I followed the steps outlined in this Support Note from Apple, and according to those instructions, the motherboard was at fault, again. I called Apple Support to explain the situation, hoping someone would be kind enough to understand and sympathize. I was very pleasantly surprised when the tech who answered the call wanted to help. He got a hold of one of the senior support engineers, whose name was Christopher, and he was also willing to help. I mention his name because I hope he’ll get some sort of recognition at work for the nice thing he did for me. Christopher authorized an out-of-warranty repair for our iMac. We were still abroad, but when we got back to the States, I took it in for service, and the folks at the Genius Bar of the Aventura, FL, Apple Store couldn’t have been nicer, too. They did some testing and discovered, to my surprise, that it was only the power supply, and, even better than that, repaired it within hours. I dropped it at the store at 11 am, and got it back by 7 pm, in working order! I was able to boot up our iMac after more than a year and access our documents, photos, emails and more. It was like reuniting with a long-lost friend. Now that’s my kind of Apple repair experience! I don’t know if my past repair experiences were flukes, or if something changed at Apple since then, but all I can say is that I’m very pleased to see our iMac working again, and I want to congratulate everyone involved in the resolution of this support ticket for being so understanding and so willing to help us. Great job! Thank you!